Do you want something unique for your restaurant? This beautiful and eye-catching waitress apron will surely make a difference in the atmosphere of your restaurant. 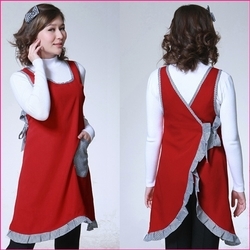 This apron comes in solid red bordered in sweet black and white gingham frills. Arm holes and neckline likewise are bordered in gingham and a huge pocket in the same gingham print is stretguically placed on one side of the apron. Your waitresses and restaurant are unique and this apron will attest to that!